Through numerous cooperations with skiing areas and mountain railways, Salzburg Verkehr enables its customers to have a comfortable and safe journey to different touristic areas. The extensive range of touristic transport services during summer to the various beautiful places of Salzburg is integrated in the regular public transport services. The Salzburg Land Tourismus GmbH’s website gives a good overview of these different offers and further provides website addresses to the respective regions. Please note: Transport conditions and tariff characteristics may vary. Travel for free: Discover Tennengau by using public transport. Please be aware that toll fee’s are not included. Free transport in the whole region of “Pinzgau” with one of the listed cards below. Included are regional busses, the “Pinzgauer Lokalbahn” from Krimml to Zell/See and all regional trains from Lend to Leogang. The so called “Sportweltbus” enables guests to travel on certain routes for only EUR 1.00 if they are holders of either the “Salzburger Sportweltcard”, the “Orts-Card”, the bus card for Obertauern or a citizen card. Whether it is summer or winter – the “Gastein Card” is an attractive added-value card for all guests of the Gastein Valley.With the “Gastein Card” guests can visit thermal baths or spas, use the mountain railway, go for a workout or use the different means of public transport. It simly gives every holder of the “Gastein Card” great value for money. Hence, holders of a valid “Gastein Card” do only pay EUR 1.50 (adults) or EUR 0.70 (children) for a one-way ticket! The “Gastein Card” is valid throughout the year and can be used on all routes and busses of the ÖBB-Postbus GmbH and Verkehrsbetriebe Lackner within the Gastein Valley with it’s well-known spa towns Bad Gastein and Bad Hofgastein. N.B. : When going to Sportgastein there is an additional toll (EUR 2.10) that only adults need to pay. Different skiing busses to many of Salzburg’s ski resorts are integrated in the regular public transport service. 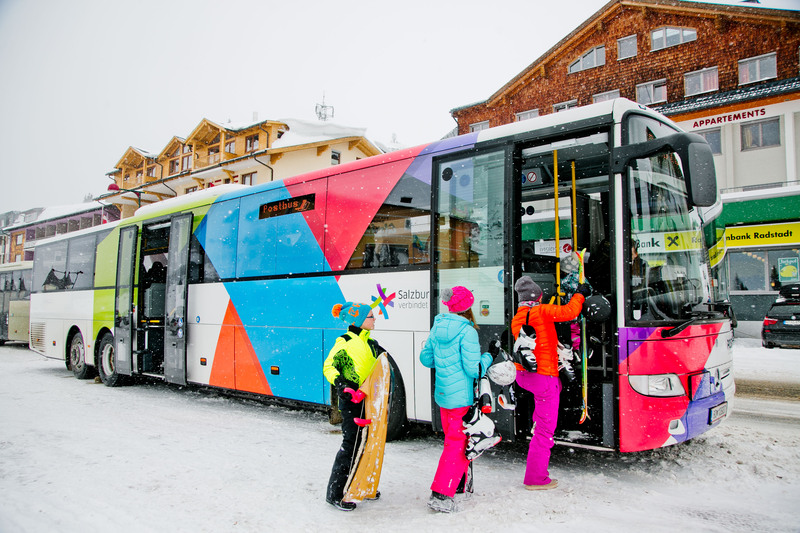 Additionally some ski lift operators and touristic organisations offer busses to different resorts. The Salzburg Land Tourismus GmbH’s website gives a good overview of these different offers and further provices website addresses to the respective regions. Please note: Transport conditions (cross-country skier, bobsleigh riders, …) and tariff characteristics may vary. As holder of the Tennengau Card you are able to discover Tennengau by public transport for free, excl. toll.